Oh man it’s July already. Today, I finished Neil Gaiman’s newest book, The Ocean At the End of the Lane. When I first started reading it, I realized that I have subconsciously been emulating Gaiman’s writing style. I have always admired Gaiman’s writing – Neverwhere is one of my favorite (if not my absolute favorite) books. Gaiman possesses an imagination that allows him to create fantastical worlds with their own set of crazy rules that he somehow makes believable. On the other hand, I can only write in some realistic world – my mind cannot create something as lush and wonderful as London Underground, the fantasy setting of Neverwhere. Beyond Gaiman’s enviable imagination, his writing style is also beautiful. He does not use words in excess, but yet revels in the English language, which results in tightly, but beautifully woven stories. Whenever I write fiction, I actively try to make every word count. In Gaiman’s works and in The Ocean especially, I imagine that Gaiman is doing the same. Though I think I write similarly to Gaiman, execution is only half of the process. No matter how beautifully I write, I can never attain the same magic as Gaiman because I lack the boundlessness of his imagination. Whenever I think, I put up mental barriers of what I can and can’t do, and I impose those on my worldview. Even in writing this, I’ve already consigned myself to my inability to be as creative as Gaiman. The Ocean At the End of the Lane spoke to me not only because I realized I have a similar writing style, but because it was written from the perspective of a child. In my youth, I used to imagine kingdoms in my backyard, amongst my stuffed animals, and on the playground in grade school. Somewhere along the line, I realized that people saw me as “weird,” and I began to observe the social cues that would make me more “normal.” Looking back, I have learned the necessary social skills to appear “outgoing,” and yet, somewhere along the line, I began to believe in the boundaries of normalcy and became part of the system. In a way, I owe it to Gaiman that some part of me still clings to childlike wonder in a world only half understood. For me, baking is similar in that I mix ingredients together, place them in the oven, and through heat and hidden chemical processes, gloppy batter somehow becomes a fine-crumbed cake. I cannot simply make up my own recipes, but I revel in making small tweaks in ingredients, each which allows me to understand baking just a little better. Writing and baking allow me to escape (at least temporarily) what is expected of me and to capture the tastes and imageries that exist in my mind. I saw the world I had walked since my birth and I understood how fragile it was, that the reality I knew was a thin layer of icing on a great dark birthday cake writhing with grubs and nightmares and hunger. 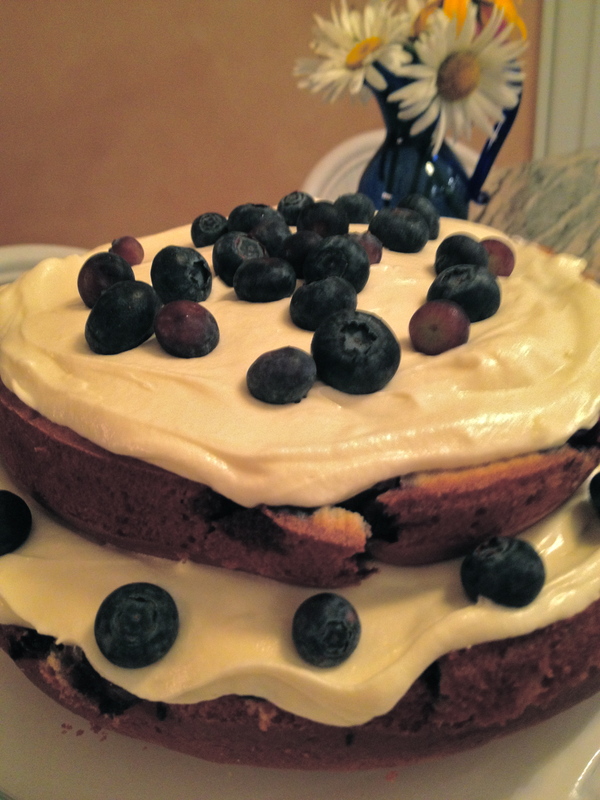 And on that somewhat morbid note, enjoy this blueberry cake with cream cheese icing. It’s fresh and sweet, with the slightest tang of buttermilk in the batter, the perfect dessert for a hot July night.